The world's financial markets are changing dramatically with the Federal Reserve on the verge of ending its third quantitative-easing campaign. The Fed's massive deluge of inflation drastically distorted markets, which are finally starting to normalize. The precious metals were crushed by the Fed's artificial levitation of the stock markets, leading to extreme futures shorting. But that looks to have peaked, a very bullish omen. What a difference a few weeks makes! Back in mid-September, the US stock markets were drenched in euphoria and hitting nominal record highs. Nearly everyone was totally convinced equities would keep on climbing forever. You couldn't turn on CNBC or open a financial newspaper without seeing endless predictions for a big end-of-year rally. And gold and silver were despised, believed to be doomed to spiral lower. The Fed foolishly engineered stock-market sentiment based on the false belief that these markets only rise, never fall significantly. This made a mockery of the millennia-old wisdom of prudent diversification of portfolios. Some thirty centuries ago, the ancient Israeli King Solomon wisely advised diversifying investments, "Give a portion to seven, or even to eight, for you know not what disaster may happen on earth." Thanks to the Fed, all anyone wanted to own was stocks. Putting all one's financial eggs in one basket is plain flat-out stupid, the height of folly! This irrational belief led to an entire asset class, precious metals, being abandoned and left for dead. American futures speculators piled on to this gold-to-zero trade, effectively borrowing vast amounts of gold and silver they didn't own to sell it short. This crushed PM prices. 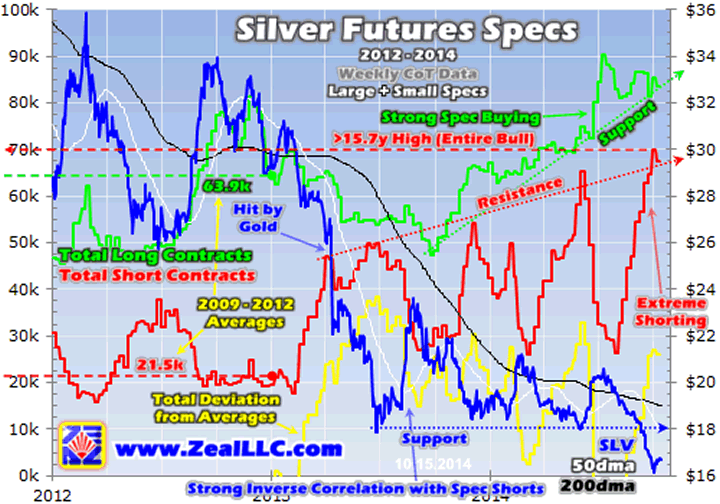 With precious-metals investment demand crazy-low, the futures traders have been utterly dominating the PM prices. And as these charts show, the lion's share of that powerful influence has emerged from the short-side trade. Both gold and silver prices over the past couple years have a strong inverse correlation with American futures speculators' total short contracts. This fact has extraordinarily-bullish implications. That will catapult gold and silver prices higher, gradually enticing investors to return. And with the Fed-distorted stock-market levitation finally rolling over, the extreme PM-futures shorting looks to have peaked. Every Friday afternoon, the CFTC publishes futures speculators' positions as of the preceding Tuesday in its famous Commitments of Traders reports. And the latest from Tuesday the 7th reveals change is afoot. This chart shows American futures speculators' total gold-futures short contracts in red, and their total long contracts in green. Before the Fed's QE3 campaign radically distorted the global markets, the levels of both longs and shorts held by speculators were dramatically different. The yellow line shows the total deviation on both the long and short side from the normal-year average levels between 2009 and 2012. Gold started falling out of favor in early 2013 as the Fed's wildly-unprecedented open-ended QE3 bond monetizations goosed the already-long-in-the-tooth cyclical stock bull. As the stock markets did nothing but rise, gold positions were sold off to buy stocks. This was particularly true of GLD shares. This ETF suffered so much differential selling pressure that its gold-bullion holdings suffered an epic record decline. But this deluge of gold supply spewed out by GLD was quickly overtaken by extreme futures selling after gold suffered a panic-like plunge in April 2013 when major support failed. American speculators' short selling of gold futures soared, rocketing above the prior normal years' average levels. And this soon led to serious long liquidations too after Ben Bernanke laid out the Fed's best-case QE3-tapering timeline in June 2013. Ever since that pair of crazy-anomalous gold plunges in early 2013, the gold price has been slaved to speculators' gold-futures trading. Note the strong and nearly-perfect inverse correlation between GLD's share price and specs' total futures shorts in red in this chart. When this one group of traders gets on a gold-shorting binge, gold's price is crushed. And that's exactly what happened once again just last month. As the US stock markets' melt-up resumed in late August and early September 2014 on the Fed-spawned euphoria, gold lapsed even more deeply out of favor. On top of that, the US dollar was rocketing higher in its longest weekly rally in history, another incredible anomaly. Futures speculators often look to the US dollar for their gold-trading cues, since gold and pretty much everything else is internationally priced in dollar terms. The result was the recent colossal binge of extreme shorting evident in this chart. Between the CoT weeks ending on August 12th and October 7th, specs' gold-futures shorts more than doubled with a staggering 104% gain to 146.2k contracts! In just 8 weeks, these American traders alone sold short an additional 74.4k gold-futures contracts. That is the equivalent of 231.3 metric tons of gold, a huge amount. Putting this extreme shorting in context is essential to understanding gold's bullish near-term outlook on short covering. When that span started in mid-August, GLD's total holdings were 795.9t. So specs' gold-futures shorting equaled a 29% liquidation of GLD's holdings in just 8 weeks! But the GLD shareholders weren't following the specs' lead, as GLD's holdings actually merely retreated 3.6% or 28.4t over that span. That 231.3t of spec futures shorting over 8 weeks works out to 28.9t per week. That is simply far too much supply for normal investment demand to absorb so fast. According to the World Gold Council, global investment demand averaged just 17.0t a week last year. This 8-week bout of extreme futures shorting hammered gold from $1309 as this CoT-week span began to $1210 as of the latest Tuesday's data, a hefty $99 drop. Provocatively though, gold's major support line near $1200 (just over $115 in GLD terms) held strong. Even in an environment of lofty Fed-goosed stock markets and a rocketing dollar spawning truly epic gold bearishness, gold carved a strong triple bottom. The American futures speculators who borrowed gold to sell low are likely to panic if it keeps rallying on stock weakness, maybe even igniting a classic short squeeze. Futures speculation is one of the riskiest games in all the markets due to their extreme leverage. Since 1974, leverage in the US stock markets has been legally limited to 2x. The maximum margin available to buy stocks is 50%. That effectively doubles stock traders' gains and losses, a 10% adverse move on 2-to-1 leverage yields a 20% loss. But the Wild West futures realm faces no such restrictions, leverage is extreme. For traders short gold futures at maximum margin, a mere 1% rally in gold prices would lead to 30% of their capital risked lost. In just the last 8 trading days, gold has climbed 4.2%. That is enough to guarantee margin calls or wipe out leveraged speculators. So futures traders can't afford to stay in a losing short position. Even if they only ran half of maximum margin at 15x leverage, the losses still multiply dangerously fast. Remember CoT weeks run from Tuesday to Tuesday, that's the highest-resolution read that is currently available on specs' gold-futures trading. After peaking at a secular-bull-if-not-all-time record high of 178.9k contracts in early July 2013, total spec shorts collapsed 53% to 83.6k by late October 2013. And even though that span endured a serious 67.7t GLD liquidation, gold still rallied 7.7% or $97 higher. That wasn't too bad in the face of the Fed's extraordinary ongoing stock-market melt-up surging to new nominal record highs at the time. 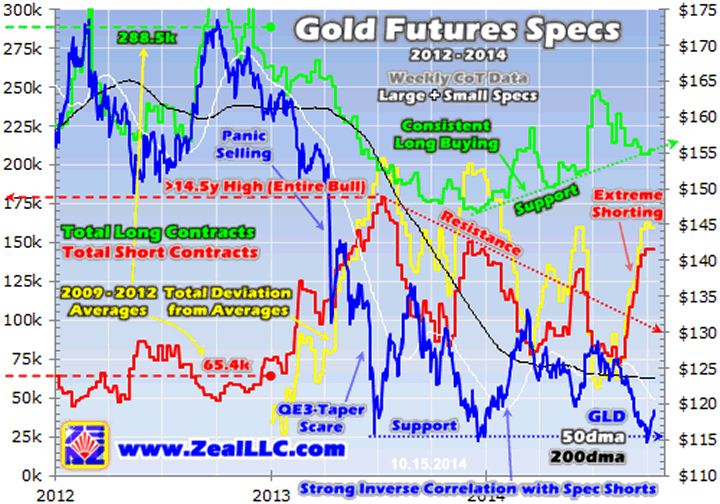 Extreme gold-futures shorts lead to major gold rallies regardless of what else is going on! Right after that the next spec extreme gold-futures shorting binge began, and soon peaked at 150.0k contracts. And gold slumped dramatically to another $1200 support test on that heavy selling. But as soon as gold bottomed, the big short covering naturally ensued. Over the next 15 weeks total spec shorts plunged 48% to 77.7k contracts. Over that exact CoT-week span gold surged 10.9% or $134 higher, despite another 3.4% or 28.6t GLD holdings liquidation on the Fed's relentless stock-market melt-up. Short covering drives big gold rallies with speculators' trading dominating the world gold markets these days. And that precedent brings us to American futures speculators' latest extreme shorting spree of recent months. Once again in just 8 weeks these traders have borrowed and sold an additional 74.4k contracts! This catapulted specs' total shorts well above the downward-trending resistance line rendered above. And it is the most extreme gold-futures shorting event of this entire secular gold bull in some aspects. While early 2013's overall shorting binge was larger, 112.7k contracts, it took 24 weeks to reach that for an average weekly shorting rate of just 4.7k. That compares to 9.3k in this latest one, which is why that newest red spike above is so extreme. And though late 2013's shorting spree was faster at 5 weeks, the total spec shorts added of 66.4k contracts were less than this latest example. It was a super-anomalous downside bet. Our CoT data goes back to 1999, and this latest CoT week's total shorts are the third highest ever seen in that secular span. And I suspect ever in history, as the futures trading in this gold bull dwarfs everything that came before it. The past two gold-futures shorting sprees led to major gold rallies despite the ongoing stock-market levitation and GLD holdings liquidation. 51% of those shorts were covered on average, in less than 16 weeks each. If we see half of today's extreme gold-futures shorts bought back to be closed, we are looking at 73.1k contracts of gold-futures buying over several months. That's the equivalent of 227.4t of gold, or nearly a third of GLD's current holdings! And that futures buying will come at a unique time when the Fed-goosed stock markets are finally rolling over so prudent portfolio diversification with alternative investments will regain traction. If gold could rally 7.7% and 10.9% higher over those last CoT spans of short covering following extreme shorting despite lofty and euphoric stock markets, what will it do in the coming months with that whole Fed illusion vanishing? This next round of gold-futures short covering is going to entice in a lot of new long-side gold-futures traders, amplifying gold's upleg. Interestingly they've already been nibbling all year. And that inevitable futures-buying-driven mean-reversion upleg in gold will almost certainly attract investors' attention back to GLD shares. As general stocks are getting pummeled, a heck of a lot more capital is going to seek refuge in GLD than current levels. As this leading vehicle of stock-market gold exposure regains popularity, its custodians will have to aggressively buy gold bullion pushing the metal higher faster! This same analysis applies to silver, which is slaved to gold's fortunes. While silver recently broke below its major support, this was on the most extreme silver-futures shorting in at least 15.7 years and almost certainly ever! When gold's recent reversal gains enough momentum to look decisive, capital is going to come flooding back into silver on short covering alone at one of the fastest rates ever seen. Talk about bullish. Thanks to the Fed's manipulations and Wall Street's self-serving propaganda, investors and speculators have forgotten about how important gold and silver are for prudent portfolio diversification. These metals thrive when stock markets are weak, and PMs prices are anomalously low today. And if the stock markets are rolling over into a new cyclical bear market as I suspect, gold is a proven performer in cyclical bears. At Zeal we've been studying and very-profitably trading gold and silver stocks for well over a decade, and our expertise in this realm is unparalleled. Every few months we take a large swath of hundreds of PM stocks to gradually whittle them down to our dozen fundamental favorites. They are profiled in depth in comprehensive and fascinating reports, the latest of which was just published last month. Buy yours today and deploy capital before this beaten-down sector starts soaring again with gold's recovery! During the Fed's QE3 stock-market levitation, the great value of sound contrarian market analysis was totally forgotten. But if the recent selling proves anything, it's that all investors and speculators need to cultivate a studied contrarian perspective. We've long offered that in our acclaimed weekly and monthly newsletters. In them I explain what's going on in the markets, why, and how to trade them with specific stocks. Since 2001, all 686 newsletter stock trades have averaged stellar annualized realized gains of +22.6%! Subscribe today with the markets reversing! And this time around with the Fed-spawned stock-market levitation finally rolling over, the precious metals' upside potential is extraordinary. Gold and silver are on the verge of regaining favor as investors once again remember prudent portfolio diversification is not only wise but essential. As capital floods back into this left-for-dead dirt-cheap asset class, led by stock investors, the sky is the limit for precious metals.